The web’s a wonderful place (most of the time). Every so often you come across a blog post that makes you stop and reconsider. 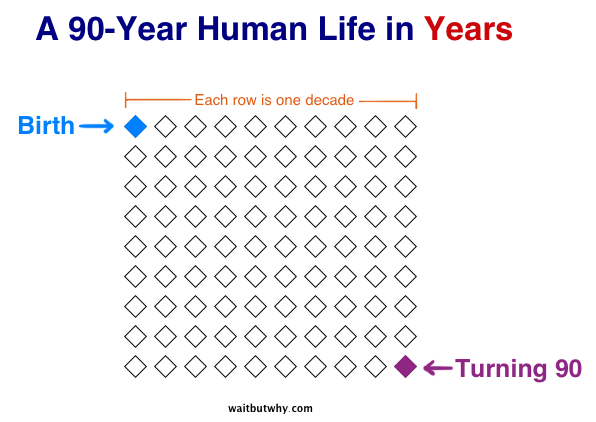 A good example of that was ‘The Tail End’ on the consistently brilliant ‘Wait But Why’ site. We all talk about how little time we have to do the things we love (we all have the same). We all keep putting things off for a later date (and never do them). And one of the characteristics of most people that keeps us sane is that we kind of assume we – and those we love – are invincible. Sure, we know that can’t be the case on an intellectual level. But most of us don’t live each day expecting it all to end. I’ve read a fair bit of stoic philosophy over recent times (right there’s a phrase I would never have imagined my younger self uttering). Everyone should at some point read Seneca’s letter ‘On The Shortness Of Life‘. And I personally think there’s a real benefit from adopting the memento mori approach. Perhaps you think it’s morbid – this constant reminder that all things come to an end (yes, including you). But that’s very much missing the point. It’s about perspective, balance and humility, removing the fear of losing physical possessions and generally just learning to reflect, instead of reacting. The second is a similar visualisation but showing roughly how many days of life the writer Tim Urban had spent living with his parents – and how long might be left to spend time together. His lessons? Live near the people you care about. Prioritise those you care about above all else. And always go for quality time. I read it a few years ago and it stuck in my head. I hope it does the same for you. He also did a TED talk ‘Inside the Mind of a Master Procrastinator’ a few years back that’s worth a watch.